Contributions to and money taken out of an Enable Savings Plan account are not in the calculation that determines eligibility for certain resource-based benefits, like SSI, SNAP and Medicaid. 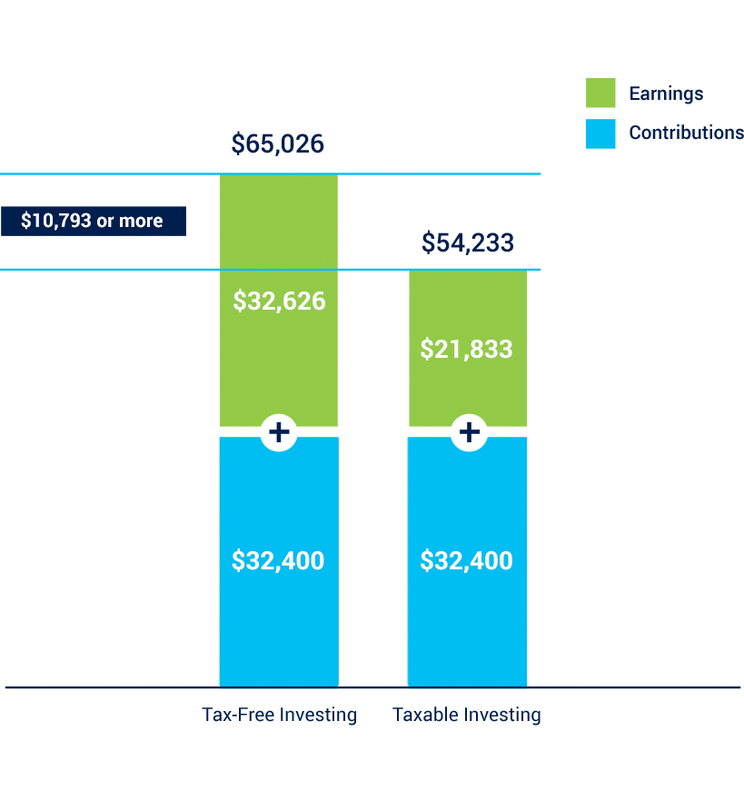 Keep in mind that this is a hypothetical example and its intention is to illustrate the difference between tax-free and taxed accounts. Lower maximum tax rates on capital gains and dividends would make the return of the taxable investment more favorable, reducing the difference in growth. Remember to report your Enable account contributions on your Nebraska state income tax return as shown below. To be eligible, contributions must have been completed online by December 31st or before 10:59 CT or postmarked no later than December 31st of the tax year. Contributors (other than the account owner) can lessen the value of a person's taxable estate. Contributions to an account are considered a completed gift from the contributor to the account owner. Contributions up to $15,000 per year are eligible for the gift tax annual exclusion. Speak to your advisor for more information. 1When the total account balance exceeds $100,000, the amount over $100,000 will count towards the SSI resource limit of $2,000. If the resource limit is exceeded because of funds in an Enable account, the account owner will enter an indefinite benefit suspension until the resource limit is below $2,000. This suspension does not impact the account owner's eligibility for Medicaid. 2The earnings portion of a withdrawal not used for Qualified Disability Expenses are subject to federal and state tax and may be subject to a 10% federal tax. 3The amount assumes an annual investment return of 7% and monthly contributions of $150 per month for 18 years. This hypothetical does not reflect an actual investment in any particular qualified ABLE plan or in the Enable Savings Plan or any taxes payable upon withdrawal. 4Investors should consider before investing whether their home state offers any state tax or other benefits that are only available for investment in such state’s ABLE program and should consult their tax advisor, attorney and/or other advisor regarding their specific legal, investment or tax situation. 5Nebraska state income tax deductions are subject to recapture to the extent previously deducted if funds are not used for Qualified Disability Expenses.